9/22 – 9/27 – Xu Bing’s film critique of surveillance in ChinaOur weekly listing includes open calls and other opportunities for artists, filmmakers, and others involved with Chinese culture in this intro section. 1) Erhu-Cello Duo with Wang Guowei & Michael Katz – The duo performs arrangements of traditional Chinese music and contemporary works by composers Zhou Long, Lei Liang, Yang Yong, and world premiere of a new work by Wang Guowei composed for the duo. Bruno Walter Auditorium, 111 Amsterdam Ave.
2) In Urban Space – DA League, a group of Chinese students and scholars at nine architectural schools on the East Coast, hosts Dongfan Chen, and the urban planning analyst Yuxiang Luo. They will approach the topic of the human and the space from the lens of art and urban planning respectively, and share their own insights. Mengwen Cao is a Chinese photographer, videographer and multimedia producer based in New York. She graduated from the International Center of Photography. Her projects have been featured on The New York Times, Mashable, BUST, Foreign Policy, The Guardian. Her recent work investigates the in-between space of race, gender and cultural identity. 4) Dead Pigs 《海上浮城》－ Five lives suddenly collide when pig farmer Old Wang’s entire stock dies en masse and turns up in Shanghai’s waterways, setting off a public health crisis. Cathy Yan’s Dead Pigs assembles a cast of characters who embody dreamers, deadbeats, and ambitious movers who must answer the question of what the individual should do in a country relentlessly marching away from its past and toward progress. 4) Annie Chen Trio 2018 Residency At Tomi Jazz – Annie Chen returns to New York after five months in China and performs two sets with her trio at the midtown Japanese jazz bar. 6) Bitter Money 《苦錢》– To understand contemporary China, caught in a Great Leap Forward from feudalism into postmodernity, you can ask for no better guide than Wang Bing, whose films render the lives of the working poor and internal migrant Chinese down to their bare, harsh physical facts. In Bitter Money, Wang follows two teenage cousins journeying together to the city of Huzhou, seeking a better life and discovering only endless labor, abusive interpersonal relationships, and exploitation without recourse. Harrowing and massively humane. 7) Oxhide 《牛皮》– A key work in the 21st century boom of Chinese independent documentaries, Liu’s totally assured debut film offers a privileged glimpse into everyday life as lived by one working-class Chinese family crowded into a Beijing apartment. The disarming intimacy is explained by the fact that the family is Liu’s own, while the 23-year-old director plays herself in this deft nonfiction-narrative hybrid, which in twenty-three static shots confined completely to the apartment manages to encompass some vast truths about family life. 8) Independent Publisher Panel with Sming Sming Books and DREAMER FTY – A book is more than a collection of words on a series of pages. The tangibility and durability of a physical book cannot be replaced by digital text and online publishing. At the same time, technological advancements in printing has allowed limited edition books and small presses to thrive and has encouraged the growth of art book fairs around the globe. 9) [CANCELED] Modern Sky Festival NYC Talk – “China Pop! The Business of Independent Music in China” – Ahead of Modern Sky Festival NYC 2018 at Rumsey Playfield in Central Park on September 22, Modern Sky artists and executives give an exclusive talk at China Institute to share insights on the growing indie scene in China. Participants in this very special talk session include Modern Sky founder and CEO Shen Lihui, Brooklyn-via-Chengdu rapper Bohan Phoenix, and Modern Sky North America President Michael LoJudice and VP of Artist Development & Booking Sijie Liu. Lucy Dong, founder of China Music Business News. 10) Barbara Pollack’s “Brand New Art From China” Book Launch – Launch event for a new book, ‘Brand New Art from China’ by critic and curator Barbara Pollack, one of the world’s leading authorities on Chinese contemporary art. Guggenheim Museum curator Xiaoyu Weng will join her in conversation. 11) Pell St. Jasmine Tea Launch – Join for the launch of Wing On Wo & Co.’s newest tea, Pell St. Jasmine, just in time for Moon Festival. Charlene Lewang of Tranquil Tuesdays will be pouring tea and community activist, Jeanie Chin will be setting up a table for individual numerology readings. We will also be serving up a limited supply of our homemade mooncakes – join us! Chen Dongfan’s Doyers Street street mural, The Song of Dragon and Flowers, is a must see. 1) Documenting China, Stories of Change (Photoville, 9/13 – 9/23) – In 1978, after two decades of a crippled economy, China announced a new policy of “Reform and Opening Up.” This policy brought on an economic miracle and drastically altered the country’s landscape, culture, and people. Since then, “change” became synonymous with China. Features: Chen Ronghui, Cheng Xinhao, Du Zi, Jiao Dongzi, Wang Dansui. 2) Yuanyuan Yang: Theater of Crossroads (Gallery 456, 8/31- 9/28) – The first solo exhibition by Beijing-based artist Yuanyuan Yang in New York showcases photographs and a performance video from four different projects—10 Days in Kraków (2014), At the Place of Crossed Sights (2015-2016), Dalian Mirage (2017-ongoing), and Yang’s current research about a group of pioneering female performers of the Chinese diaspora. Interlacing the existing stories and historical events embedded in the works from these projects, the exhibition forms a cohesive narrative oriented around migration and war in the 20th century. 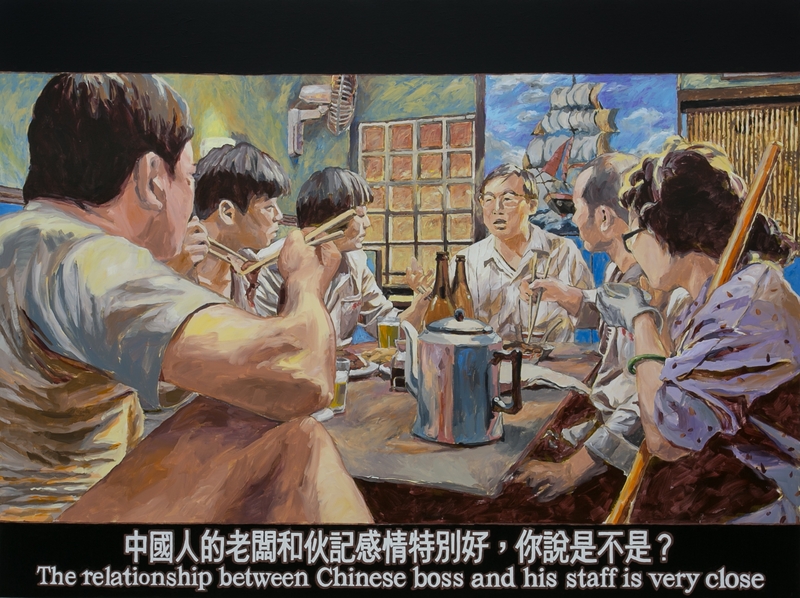 Yuanyuan Yang highlights five prominent figures in relation to the aforementioned projects and, through these characters, the exhibition gives voice to individual stories and re-contextualizes the complex history of diaspora and cultural circulations. These highly idiosyncratic and intricate narratives are embodied in each project in this exhibition. In a theater play format, Dalian Mirage stages stories of various figures from different eras in the context of the Sino-Japanese War and the colonial history of Dalian, China under Japanese occupation between 1905-1945. The work reveals the forgotten homecoming of displaced Japanese in China. By narrating stories of several photographers in Porto Alegre, Brazil in the late 19th and early 20th centuries and the artist’s personal encounters with them, At the Place of Crossed Sights explores the history of European and Chinese immigration to Brazil. The artist’s newly developed and ongoing project traces a lost 1939 film by female Chinese-American filmmaker Esther Eng. By assembling surviving fragments of the Chinese diaspora, Yang intends to unveil the backstage world of female performers in the Cantonese opera, film and entertainment scene between 1914-1970. Collectively, Theater of Crossroads sheds light on marginalized groups under the impact of colonial policy and identity politics. 3) Liao Guohe: Burn Witches (Boers-Li Gallery, 9/8 – 10/20) – In his New York debut solo exhibition, this self-proclaimed realist, Liao creates a systematic visual language that gives him freedom to speak out about the social climate in China and beyond. Often threaded through a thematic, non-linear narrative, Liao’s serial paintings challenge the strictures of text vis-à-vis image by juxtaposing Chinese characters with ingenious symbols and idiosyncratic elements. Burn Witches features Liao’s latest series reflecting on the infrastructure of power. Aroused by the current dynamics in Chinese politics, Liao’s new body of work conjures up the ‘witch’ as a fluid identity defined through power relations of global relevance and imbued with such symptoms of social unease as anxiety, fear, struggle and mistrust. 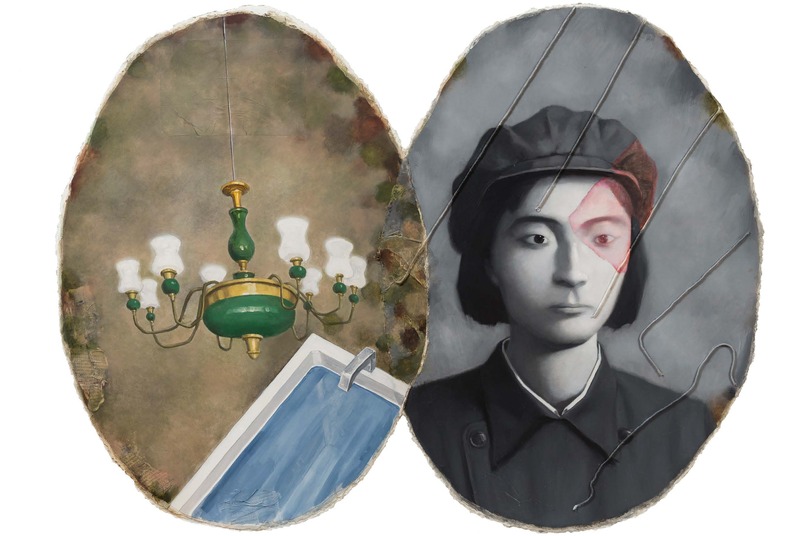 4) Zhang Xioagang: Recent Works (9/7 – 10/20) – The paintings in the exhibition build on Zhang Xiaogang’s long-held interest in portraiture and narrative imagery with domestic scenes as his primary subject matter. However, in these recent works, a new compositional dynamic has emerged through the figures. In the artist’s earlier figurative portraits, such as the iconic Bloodline – A Big Family series, the subjects are presented in group formations, positioned in the foreground of the canvas. In these new portraits, a powerful weightlessness or instability emerges. The figures drift upon the canvas, balance on precarious wooden stools, and even float within a bathtub of water—projecting a sense of isolation and alienation from their environments. 5) Shang Yang: New Works (Chambers Fine Art, 9/15 – 11/3) – Born in 1942 in Hubei province, China, Shang Yang was nearly forty years old when he first won wide acclaim with the painting Boatmen of the Yellow River that he submitted for his postgraduate degree at the Hubei Academy of Fine Arts, Wuhan. As with so many of his countrymen, the tumultuous political history of China that coincided with the leadership of Mao Zedong, not least the chaos of the Cultural Revolution from 1966 to 1976, led to a belated start for his professional career. With this painting he abandoned the Socialist Realist style that prevailed in China at the time and embarked on a career of restless experimentation that continues until the present day. Shang Yang was less affected than artists of a younger generation by the stylistic experimentation associated with the ‘85 New Wave, the wide-spread proliferation of artist associations that occurred in China in response to the influx of information regarding contemporary art, literature and philosophy in the West during the 1980s. However, in the late 1980s and early 1990s he entered a brief period of stylistic polymorphism. The most important of these phases occurred in 1988-1989 when he executed a group of abstract paintings titled States in which the focus was on the nature of the materials. 6) The Impossibility of Form (Cuchifritos Gallery, 9/15 – 10/14) – In their eighth annual collaboration, Cuchifritos Gallery and Residency Unlimited presents new works from artists Tomás Cunha Ferreira (Portugal), Tzu Tung Lee (Taiwan), and Kairon Liu (Taiwan). Tomás Cunha Ferreira’s work combines various supports, in a cross-border and open circuit practice – they function as prototypes, which can take on various stages and states – as reading scores, notations, visual poems, emblems, patterns, paintings, murals, etc. To this extent, each work results in a condensed hybrid figure, whose reading is in constant transition between visual elements and rhythmic or sonic ones. Tomás Cunha is currently running a beach project at Cova do Vapor, Trafaria – a fisherman’s marginal community in the outskirts of Lisbon (Vapor nº1, may 2018, included works and performances at the beach by Ana Cardoso, Alexandre Estrela, Tomás Cunha Ferreira, Martin Laborde, Gary Hill, Miguel Soares, João Simões and Belén Uriel). Lee Tzu-Tung(李紫彤) is a new media artist, a political activist, and a visual anthropologist whose art practice combines rigorous academic research with political activism. Through performances, web-art, installations, fictional and experimental films she examines how one can survive, manipulate, regain autonomy through their political identities, with a special focus on the hegemony of Chinese Sino-centrism, the trauma of modernity and the current epistemological injustice. Lee Tzu-Tung was awarded the Experimental Film funds from the National Cultural Art Foundation in Taiwan. Her political work includes organizing monthly conferences at Café Philo Chicago and Café Philo New York, working with the political youth NGOs Overseas Taiwanese for Democracy, and editing the bilingual political magazine NewBloom. As a visual artist and photographer, Kairon Liu‘s practice reflects his observations about beliefs in human society through the creation of narratives exploring different issues related to religion, disease, and common values. Since 2017, Kairon is developing the project Humans As Hosts focused on understanding the living situation of people with HIV and heightening awareness about AIDS. In collaboration with social networks, NGOs, and Health Authorities, Kairon recruits HIV-positive individuals to volunteer as participants. The resulting images are to be viewed as the proof/disproof of the stereotypical prejudices and discrimination produced by society. Kairon Liu is the National Winner of the 201 Sony World Photography Awards (SWPA for his project “Married the Christmas”). 7) Chow Chun Fai (Eli Klein Gallery, 9/8 – 11/17) – Fai is one of the many artists influenced by the socio-political turmoil which transpired after the return of Hong Kong, a former British colony, to mainland China in 1997. As past chairman of Fotanian Artist Village in Fo Tan and a member of Factory Artists Concern Group, Fai is one of the few well-known artists in China who is actively engaged in politics. Continue reading about the exhibition. 8) Metamorphosis: Liu Dan’s Fantastic Landscape and the Renaissance (Nicholas Hall, 9/13 – 11/23) – In this exhibition, Liu Dan will present a major landscape painting inspired by the Renaissance German artist Martin Schongaeur’s iconic print Christ Carrying the Cross alongside the original print, as well as a small selection of Old Master works on paper from the Renaissance onward by Parmigianino, Perino del Vaga, and Il Guercino among others. This is his first exhibition with the gallery and the first of its kind in New York to present Liu Dan’s painting in the context of its original European point of reference. Liu Dan is among the most original and significant living artists in China. While working with the triad of ink, paper, and brush – the one constant in an otherwise highly diversified tradition for Chinese ink paintings in the past centuries – Liu Dan has pioneered an idiosyncratic idiom in the contemporary practice of ink that redefines the boundaries of the convention. The painting on view is extremely rare in Liu Dan’s small oeuvre for its direct reference to a specific Old Master picture. Derived from Schongauer’s multi-figural composition, it is executed with utmost technical finesse and alludes to traditional Chinese landscapes. Replete with illusionistic details, the painting takes on an abstract quality. It demonstrates the artist’s profound knowledge of Classical Chinese paintings as well as an enlightened appreciation of the European Old Masters. The exhibition will be an extraordinary opportunity to experience Liu Dan’s work with the European historical sources that have been absorbed into the worldly and timeless vision of the artist. Lead image: On the banks of the Yangtze River in Wuhan.